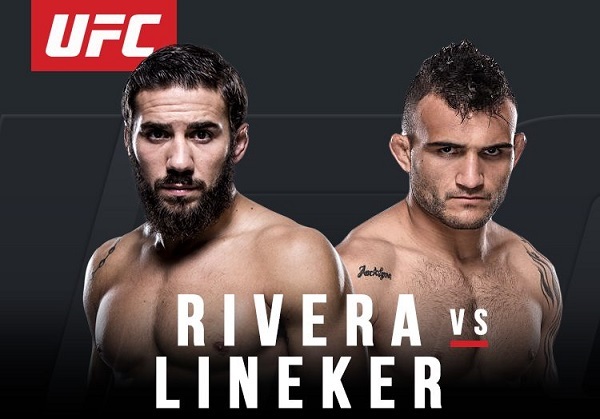 Less than one week from the UFC’s final pay-per-view event of 2017, top-ranked bantamweight fighter Jimmie Rivera is once again in search of an opponent. John Lineker is off the Las Vegas based fight card due to undisclosed reasons as reported to Ariel Helwani of MMA Fighting. Lineker stepped up to take the fight on two week’s notice after former champion Dominick Cruz sustained a broken arm. Cruz and Rivera were scheduled to fight on the December 30 fight card with the winner likely getting the next crack at the title. The UFC is currently working on finding a replacement opponent for Rivera. There’s no word just yet on if he’ll will remain on the card. Rivera is currently ranked number four in the UFC bantamweight rankings. Lineker is sitting at the number six spot. ‘El Terror’ (21-1) has not lost a fight since 2011 when he was TKO’s by Dennis Bermudez on the Ultimate Fighter. The bout was an exhibition so does not count toward his professional record. The sole loss on his record came via split decision in 2008 against Jason McLean in Ring of Combat. UFC 219 is headlined by a women’s featherweight title bout between Cris Cyborg and challenger Holly Holm.